Editorial credit: BakerJarvis / Shutterstock.com. Tourists have been flocking to Montreal this summer. Photo credit: shutterstock.com. This summer season could be one of the best for Montreal’s tourism industry. According to a report on CBC News, the number of tourists visiting Montreal could reach 11 million. This is an impressive number for a city of 1.5 million, and it is expected to be reflected in the economy. Tourism Montreal hopes that the spending by tourists will increase by 6% from 3billion. Most of these tourists are from overseas countries such as China. Other international visitors to Montréal come from the UK, France, the US, Germany, Japan, and Mexico. January indicated the positivity by Tourisme Montréal about the possibility of having more visitors this year, about 10.7 million tourists. The organization cited the numerous events that would be hosted during the various celebrations in summer. The organization estimated a 5.3% rise in tourist numbers with 7.5% coming from overseas and 5.7% from the US. These projections seem to be coming true with the number of tourists arriving in the city increasing. Being one of Canada’s leading cultural areas, Montréal attracts numerous visitors every year. With this year’s anniversary celebrations, even more visitors are expected. Various factors have contributed to the increase in tourists, for instance, the numerous festivals being held in the city. Some of the celebrations include the 357th anniversary of the founding of Montréal and the 150th birthday of Canada. These two celebrations have attracted more than 175 related events, for example, the Just for Laughs festivals. The increase in direct international flights has also increased the number of tourists, especially from China. Other family friendly events still going on in Montreal include the Marché des Possibles which will end on August 13, discounted and free events at the Pointe-à-Callière Museum and the theatrical production of Shakespeare’s Much Ado About Nothing by the Repercussion Theatre running from July 13 to August 15. Tourism is a major contributor to the economy of the city and an important source of revenue and employment for those in the hospitality industry. The industry receives most of its visitors during the summer for its numerous fairs and festivals. 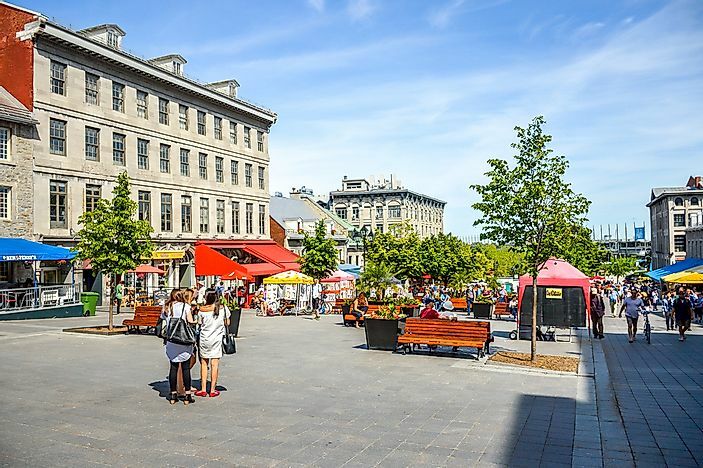 Some important areas for tourists in Montreal include Crescent Street, Saint-Laurent Boulevard, and the Plateau Mont-Royal neighborhood. The three areas are known for their active festivities, hotel, and an active nightlife culture. Other major tourist attractions in the city include Old Port of Montreal, Casino de Montréal, Bell Centre, Montreal Biodome and the Montreal Science Centre. Tourisme Montréal is an organization that promotes Montreal for international and local tourism. The organization seeks to develop both leisure and business tourism by keeping up to date with market dynamics at any particular time. The organization also publishes yearly tourism reports and provides projected tourism figures as well as initiating campaigns to attract tourists.